When it comes to education, Americans may hotly debate testing, grading and teacher accountability, but one topic that finds wide-spread support among educators, parents, legislators and students is the value of technology in the classroom. With a majority of teachers reporting in a PBS Learning Media survey that they use technology to reinforce and expand on lessons and motivate students to learn, it is only a matter of time before your child will use technology in the classroom. When your child needs to use technology to support their learning, will you know what type of cost-effective device to buy for maximum learning benefit? To choose the best device for your child, you need to think about how they will use the device in their learning. Some projects will require work on a PC – such as online assessments or activities that use Microsoft Office applications. If your child needs a quick, easy and cost-effective way to access the Internet for research or online collaboration, a Chromebook might be a good choice. With the Google Apps for Education suite, Chromebooks allow students and teachers the ability to search the Web and do most basic productivity activities. Additionally, if your child’s school system is set up to support Chromebooks, teachers can monitor student progress and streamline communications. * Screen size – Chromebooks vary in screen size so for parents looking for a more generous screen, Toshiba offers a 13-inch screen and HP offers a 14-inch screen. * Durability – Some Chromebooks, such as the Lenovo X131E, have been developed and designed to be especially rugged with students in mind. 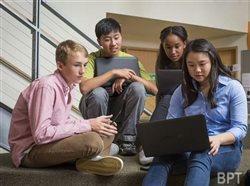 * Battery life – With longer battery life, Chromebooks are less likely to turn off mid-class. Intel-powered Chromebooks boast a 57-percent longer battery life while Web browsing, according to a study by Principled Technologies. * Speed – A device’s processor should be powerful enough to ensure students can easily and quickly read textbooks and take notes online, complete homework, create presentations and share files. The Principled Technologies study also revealed that Chromebooks powered by Intel offer faster speeds and better performance than competitor processors. Faster access means students will spend less time waiting and more time learning. * Graphics capabilities – Much of what students do in class will be graphics-intensive (such as an anatomy simulation), so their Chromebook should run on a processor that will allow for smooth, vibrant graphics across all applications. * Start-up time – Students are busy and easily distracted. Shorter start-up time means the learning process can begin more quickly. * Price – Although prices on digital devices are becoming more reasonable across the board, Chromebooks can be especially cost-effective. For example, the Acer 720 is a lighter and lower cost device. * Support/resources – Students don’t learn in a vacuum and their Chromebooks shouldn’t have to operate in one either. It’s important to choose a device that offers students and parents access to support and resources 24/7. Intel supports students, parents, and teachers with K-12 Blueprint, a website that provides information about products, capabilities and features of the Chromebook that are useful for students. Visit www.k12blueprint.com/chromebooks and follow @IntelK12Edu on Twitter for further resources. Already accustomed to technology in their daily lives, today’s students are eager to embrace technology in the classroom. With educators and parents on the same page, they can create a learning environment where students can thrive.